Kinell, to say shoite happens is putting it lightly. Good luck with the rebuild, hope it all goes well. When it gives me oil pressure trouble again, then i need to wave the white flag and apply for a divorce (from the bike that is). For the time being, i will keep on riding the Tiger as long as it purrs and does not grab me by the throat. Whichever choice, you've given it your all. May I suggest, tho: the mechanic's bodge (from time immemorial) of stretching - or replacing/shimming - the spring in the oil pressure relief valve to achieve a higher oil pressure. Mind, there's no free lunch re. the pressure/volume equation (more pressure/less volume, etc) -- but, more pressure may silence that warning light (if it becomes necessary). That would surely help increasing the pressure at higher RPM when the oil pressure becomes high enough to open the relief valve, so oil is bypassed directly to the sump. 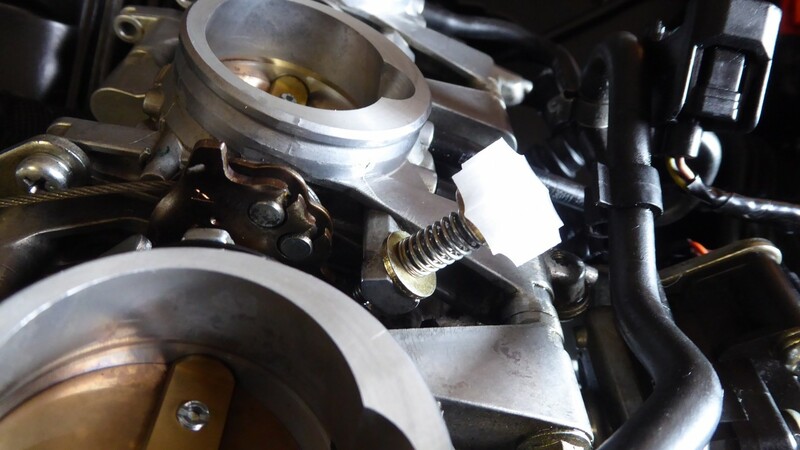 By weakening the spring or shimming the relief valve, you can increase or decrease the maximum oil pressure, which is reached at lets say 5000 to 6000 RPM. 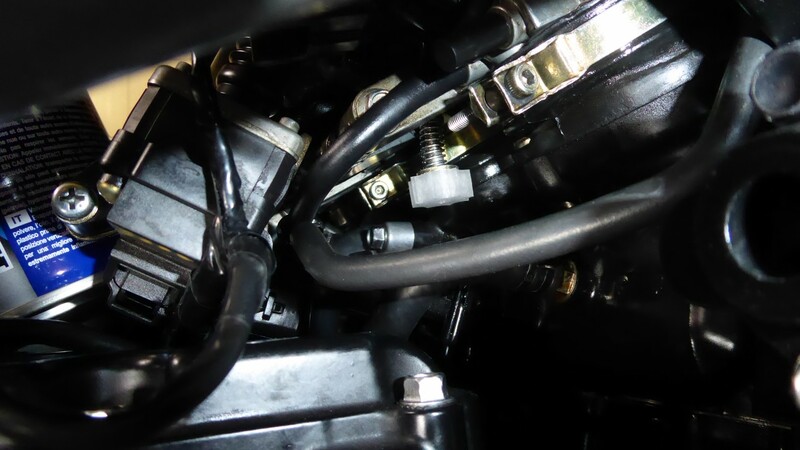 But when the bike is idling, which is about 1200 RPM, the oil pressure relief valve is always closed and shimming or weakening the spring has no influence. It is at the idle RPM that the bike had a bit too low oil pressure, especially when the engine was hot (in hot weather, or after riding a low speed in hot weather) and the oil light came on. When the problem is not solved with the new bearings, a last trick i could do, is to increase the idle RPM from 1200 to 1350 or 1400. The RPM is set by the ECU via a stepper motor that moves a mechanical lever, that again offsets the minimum opening of the throttle, so to increase/decrease the idle RPM. 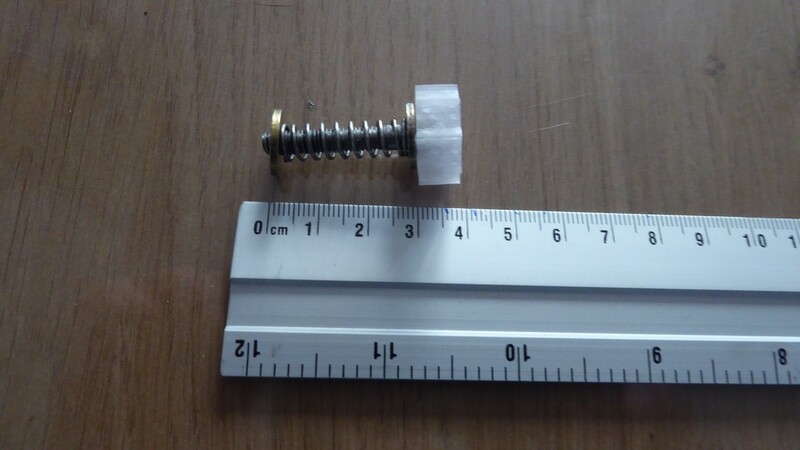 By removing the mechanical lever or by disconnecting it from the stepper motor, it is possible to set a fixed idle, simply by adjusting a set screw on the throttle. The engine then will always have the same fixed idle RPM, whether the engine is cold or hot, whether at high altitude or low. Most people that use this trick on the Tiger report that there are no issues when using a fixed idle RPM in any circumstances. In a few months i know if i need the trick or not. simply by adjusting a set screw on the throttle. 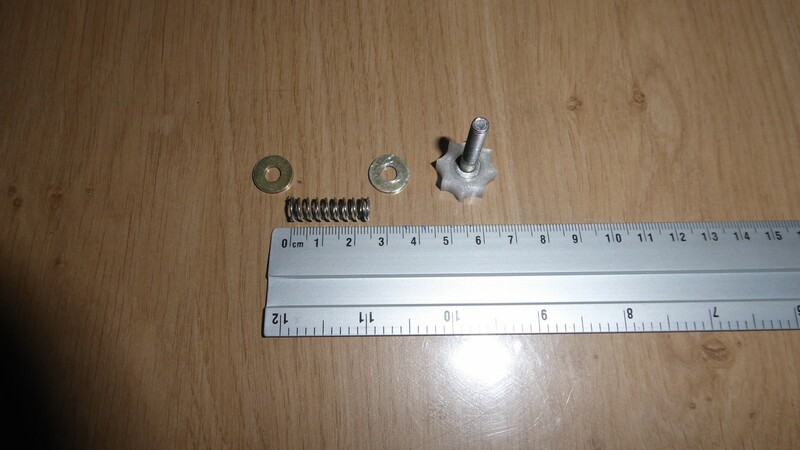 I'm referring to the throttle stop screw that can be used to set the idle RPM after disconnecting the stepper motor lever from the stepper motor, so the stepper can not adjust the idle throttle position anymore. It is quite difficult to adjust this stop screw while the throttle body is installed, so i will try to find a way to do this. Another way is to keep the lever, move the stepper out of the way (it has to stay connected because otherwise an error will be flagged) and make a construction to adjust the lever using a bolt. to be easier than i first thought and it will give some extra oil pressure at idle and me some extra faith and less red-(oil)-light-paranoia. So today i investigated how the idle stepper motor mechanism and the throttle stop screw at the bottom of the throttle body work. 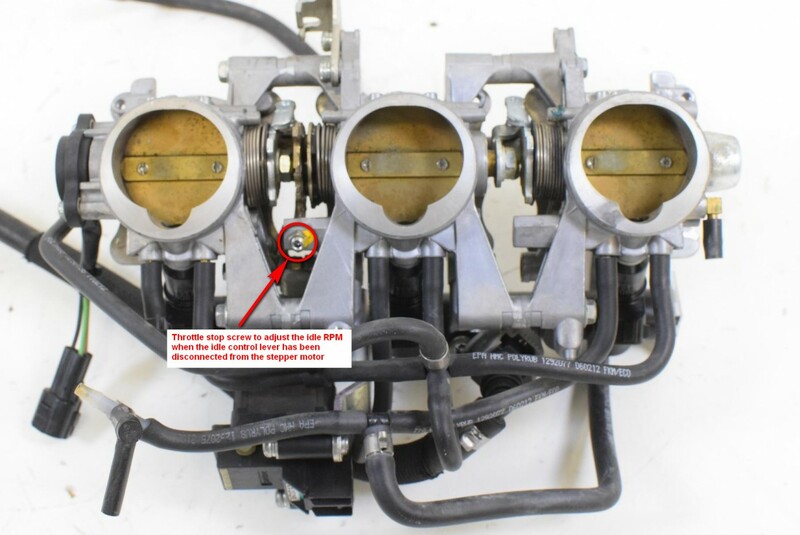 I discovered that i only need to adjust the throttle stop screw at the bottom of the throttle body to set the minimum idle RPM, which is used when the engine is warmed up. that determines the idle RPM when the engine is warmed up. The stepper motor increases the idle RPM at a cold start and does this via a lever that moves the throttle valve further open. When the engine is warmed up, the stepper decreases the RPM again to the minimum idle RPM, which is set by the throttle stop screw. So to increase the "warm engine" idle RPM, all you have to do is adjusting the throttle stop screw. so the cold start idle is also higher. But this re-calibration is not necessary when the cold start idle is high enough and you only want to have a higher idle RPM when the engine is warm. New throttle stop screw so you can adjust the idle RPM with the throttle body installed. 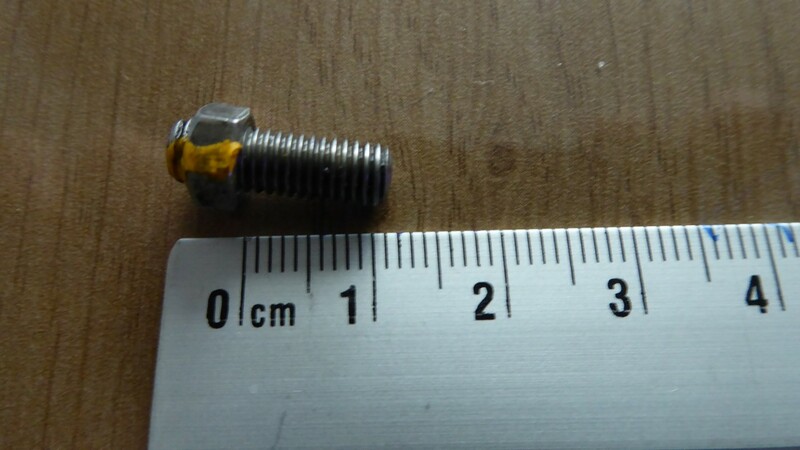 The head of the allen bolt (M5x30 or M5 x 25) is pressed into a 3D-printed part that allows to adjust the screw with 1 finger. The screw is hard to reach, so the shape of the part is designed so you can push against it to rotate the screw in either direction. New throttle stop screw can be reached while the throttle body is installed. I don't have small hands, but i can adjust the screw with 1 finger without touching any hot parts of the engine. 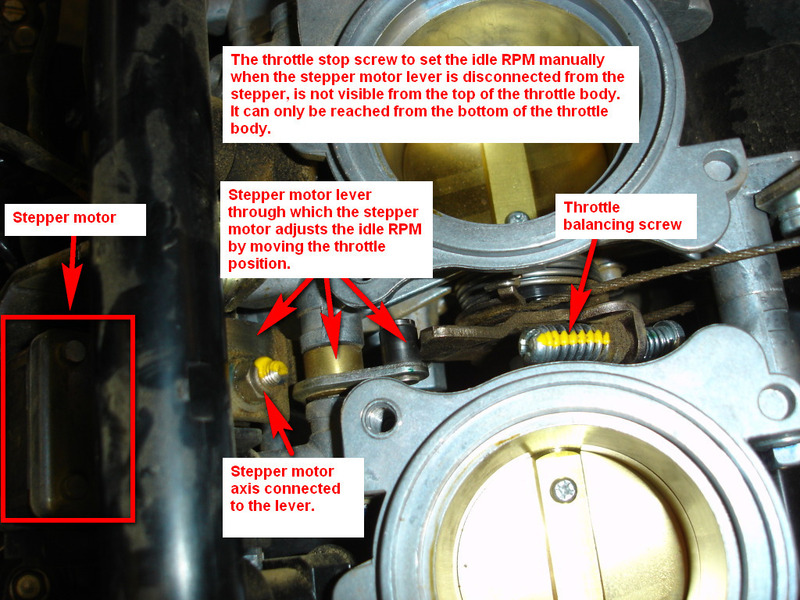 The screw has to be adjusted when the engine is hot, so the stepper motor is not pushing the throttle valve open and the throttle is resting against the throttle stop screw.